Lavish, luxurious and opulent are among the adjectives describing the Grand Del Mar in Los Peñasquitos Canyon Preserve of sunny California. Becoming the Fairmont Grand Del Mar has only enhanced the property. Just five miles from the Pacific Ocean, complimentary shuttles transport guests to the coastal towns. Plan a day at the Del Mar beach or shop, dine and then watch the seals on the shore of La Jolla. When the Fairmont executives took over operations, they wisely retained two key personnel, Chef William Bradley and Golf Director Shawn Cox. Chef Bradley’s five-star Addison Restaurant is popular for locals’ special occasions with grand views of the property from the balcony. The kitchen is a main attraction, efficiently bustling with gourmet meals plated like artwork. Multiple sommeliers assist with pairing every fine offering. Amaya on the lower floor of the resort is equally tasty from the lump crab eggs benedict with chipotle sauce for breakfast to fruits de mer for lunch, topping off with lobster for dinner and ending the night in the lobby with fantastic live music and a final libation or two. Club M serves golfers and patrons who want to watch overlooking the golf course. It comes alive on weekend nights with a DJ and dancing drawing the hip sophisticates from up and down the coast. The Fairmont Grand Del Mar is a Mediterranean style estate with sculptured gardens and beautiful golf. Every hole of the Tom Fazio designed golf course feels like a private encounter winding through the lush canyon. Leveraging nature’s elevation and landscape, it’s a dream like state of golf until the awakening of the last 3 holes. 16 is a long downhill par 5 lined by dense brush with a lake behind the green that illuminates at dusk. Tee over the water on 17’s par 3 and steady yourself for one of the most beautiful and challenging finishing holes. 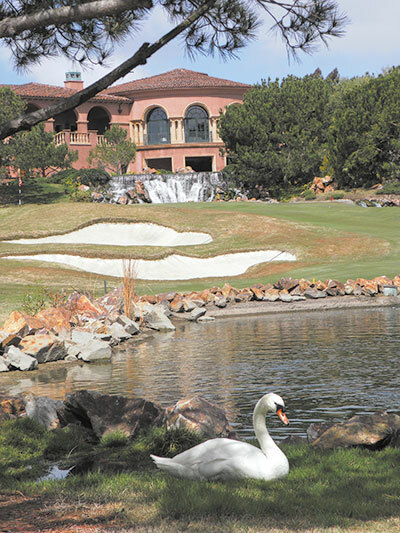 A chute like fairway rolls into the swans’ stream with cascading waterfalls above the green. Difficult to reach in two, M Club patrons in the clubhouse are easily entertained by the attempts. Just like your stay, you hate to see the round end. It is playable over and over again. Fore caddies are well trained with strategic guidance, especially helpful on number 12, a long par 5 where it is imperative to stay left all the way or face losing a ball or two as is the case for many who don’t listen. The caddies’ experiences provide plenty of stories during the round. They truly enhance the experience, as does instruction onsite. The training area is high above the driving range for a more intimate experience without the distraction of onlookers. Golf Director Shawn Cox leads the team with steady patience. Having instructed Phil Michelson’s kids reflects the level of trust in his knowledge and expertise. He pulled out nearly all the arsenal in his bag to successfully remedy our beach baby bunker magnet’s challenge of getting out. Whew, thank you! Hiking trails, tennis courts, workout facility and an equestrian center complete the sports mix. After all that, you might want to get stoned at the spa. The 90-minute “Stoney Silence” is a hot rock treatment like none other. A therapeutic massage with aromatic oils and flat warm rocks slipped into pockets of naked skin and sheets, are left to transfer heat to muscles until the end. It’s the best rock collection ever. Make time to relax before and after, slipping into the eucalyptus steam room, dry off in the sauna and whirl in the Jacuzzi. Comfy chaise lounges with soft blankets and magazines in front of a fireplace further relax the body and spirit. Ensuring the quality of your experience, someone might whisper an offer of a warm neck wrap, cup of tea, a wand of fruit or plate of truffles. The grandiose fountain and floral fantasy lead to the most luxurious of accommodations. Shutters open or close for privacy over the bathtub to the elegant and spacious single bedroom. The lovely palazzo suite is large enough for a family reunion with a kitchenette, beautiful dining table, living room with big sofa and matching big screen over the fireplace. All include a balcony overlooking the golf course, statues or pool and jacuzzi area with deep cushioned lounging. Attendants ensure hydration in the palatial pool setting. Villas are also available for sale or rent and complimentary shoeshine is provided over night. How grand and just hours away! www.granddelmar.com.